We had an enormous party at our house this past weekend. My roommates are quite keen on beer pong. I myself, not so much. The thought of guzzling piss-poor beer with grubby ping bong balls having taken a marinating swim in it is not so appealing to me. Regardless of my take on it, the game is astonishingly popular in the united states. Go figure. But, hey, to each his own! Everyone had a great time, and that is what counts most for a party. Instead of joining in the reindeer games, I thought I’d enjoy playing host more. This way all those athletes would have a way of satisfying the hunger such strenuous play is bound to engender. You all might have already guessed the menu from the title of this post. The use of any non-asian aubergine is always a little labour intensive on account of their bitterness. To overcome this inherent quality of these delightful nightshades we salt them and let the salt draw out their most bitter liquids before continuing with whatever other devices we have for them. This rule is only excepted in situation where one is simply roasting the aubergine to oblivion, like when making baba ganoush. Unfortunately, that is not the case with this recipe, and only the plump Italian aubergines will work here, because the slender or squat asian varieties wont yield slices that wrap aptly around things. Even though this recipe takes some work, people are always intrigued by it, it is always a crowd pleaser. To begin, get a very sharp knife. Slice off the tops and bottoms of the aubergines so that they are left flat on both ends. Stand them up, and proceed to slice them as thinly as you can while keeping the knife straight. This doesn’t take atomically thin slicing, like Jolliet Jake demands of his garlic, but thinner is better. 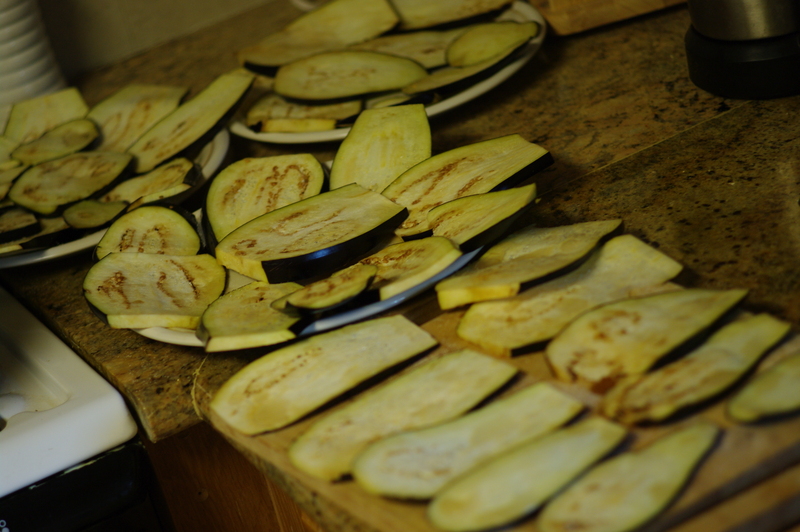 Once you have aubergine slices laid across countless plates, dust them all thoroughly with salt. Then wait, and let the salt do it’s drawing magic. Chemistry and physics are indeed real, and nowhere more delicious than in the kitchen. I normally wait 15-30 mins for this. While the aubergine slices are relieved of their bitterness, set the oven to 400〫F, and dice up the two cloves of garlic. Add the diced garlic to the cup of olive oil. Slice one of the three lemons in half. Spritz a tiny sprinkle of lemon into the garlicky olive oil. Stir that up well. Once you see the juices really beading up and dripping out of the aubergine slices, rinse them off and pat them dry. If you are short on time, or towels, you can just wipe away the excess liquid, but if you do this, make sure to remove the salt too, lest the final product prove too salty. What a shame that would be. 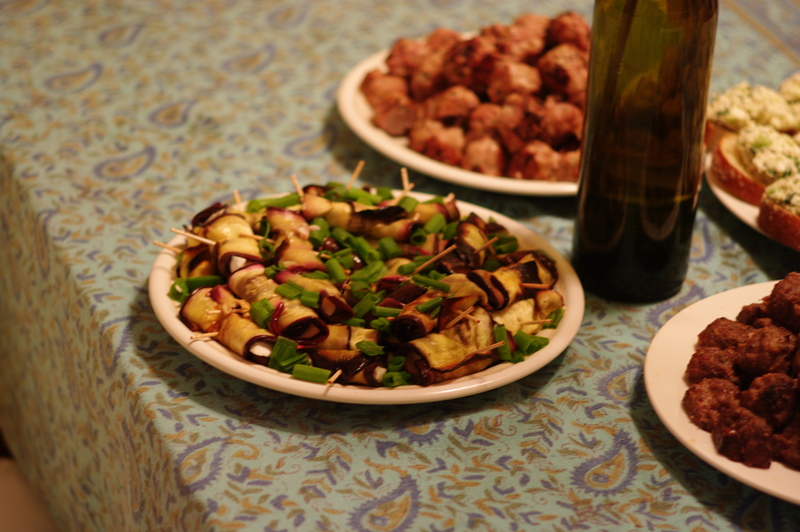 Lay the dry aubergine slices on baking trays, and brush each one down well with the garlicky oil mixture. Put the trays in the oven. Cook for about 8 minutes or until the aubergines start to brown. Once they are browning remove the trays from the oven. Flip each slice over and brush them down again with the olive oil mixture. Put them back in the oven so the other side browns. 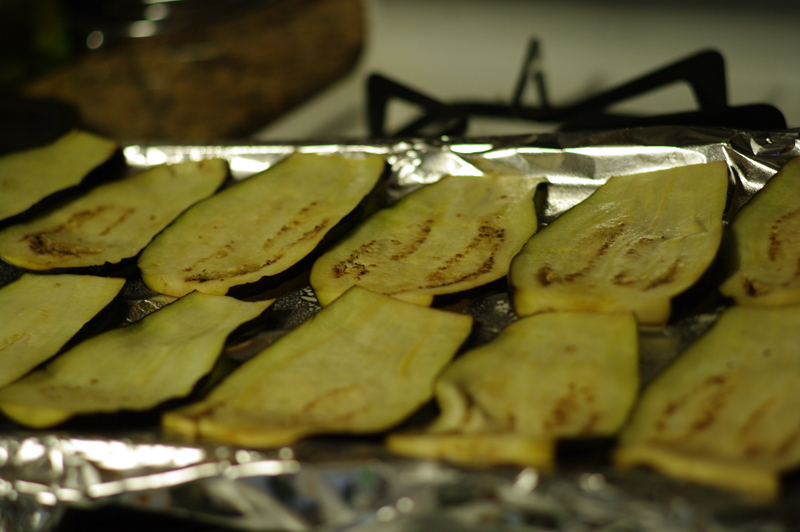 Be careful not to overcook the aubergines, because if the slices are too crispy they will be too brittle to roll. They are done when the edges begin to curl and are crispy, but the centers are still slightly soft. Approximately another 8 minutes. Remove the slices from the oven. Slice the second lemon, and spray all of the slices down. Let them cool. Once they are cooled, cut the goat cheese into pieces, each as wide as an aubergine slice. Place each cheese piece at the base of each aubergine slice, and roll the thing up. Pin it shut with a toothpick. Once all of the aubergines are rolled up around pieces of cheese, slice the third lemon, and spritz the whole lot of them. Then, slice the chives or green onions and scatter stylishly across the dish. This recipe is interesting for a number of reasons. 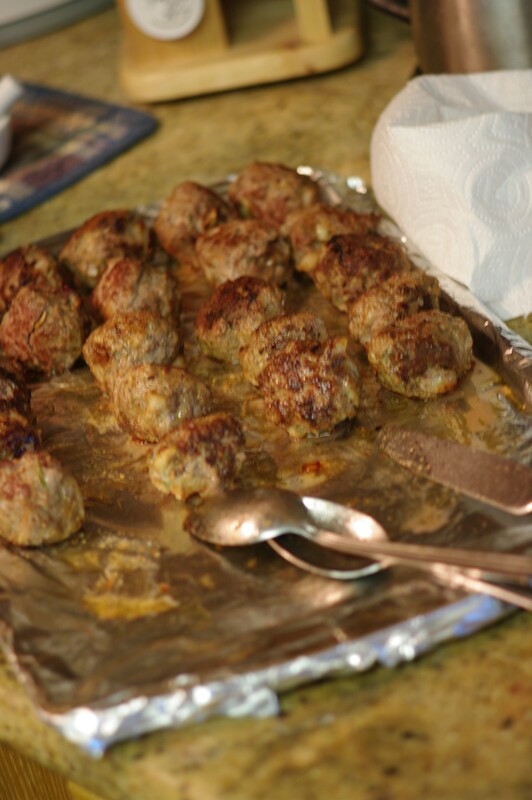 First, most meatballs are held together with some kind of old bread or bread crumb as a binding. My round childhood has long since led me to eschew most use of grain unless it is absolutely necessary to a recipe. I find the use of a second egg does just fine in binding the meatballs together. 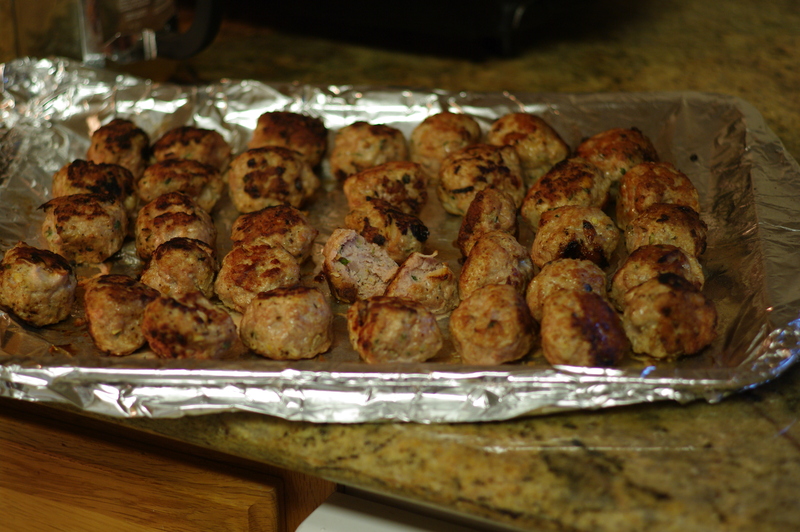 Second, the flavors in these meatballs hit you progressively. You don’t taste them all at first. They sort of work their way into one another, and most people are amazed that one thing could have so many tastes, over so many moments. It’s sort of like a gustatory arpeggio, and just like suspensions in music leave listeners at the edge of their seat, craving harmonic resolution, these meatballs, will leave your diners with forks never quite leaving their lips. Lastly, the recipe is interesting because it uses a trick from my grandmother, Ilga. She cooked with a lot of bacon, because, well, frankly, she was amazing, and so is it. Bacon is super fatty, and on account of that, very slippery and tricky to slice. But, in my opinion, it is essential in any ground beef recipe. Once upon a time, the idea of lean ground beef was anathema. Unfortunately, these days, even chuck is mostly lean. We bon-vivants are left with no option but to supplement our ground beef with bacon. Alas, it is such a pain to slice! That is where the freezing comes in to play. Frozen bacon can be diced in no time. It doesn’t slip, or slide, dangle, drop, dip, or drip. Just dices. Thank you, Ilgush. So, basically, to assemble these meatballs you dice the bacon as finely as you can. Then, put the cumin and coriander in a little mortar and pestle, and grind it up relatively coarsely. If you don’t have a mortar and pestle, powdered varieties will work, but use slightly less. Then mix everything together. Your hands will be nice and beefy when you are finished, but, that is all part of the fun, non? Heat the oven to 400 F again. Then heat a pan to medium heat. 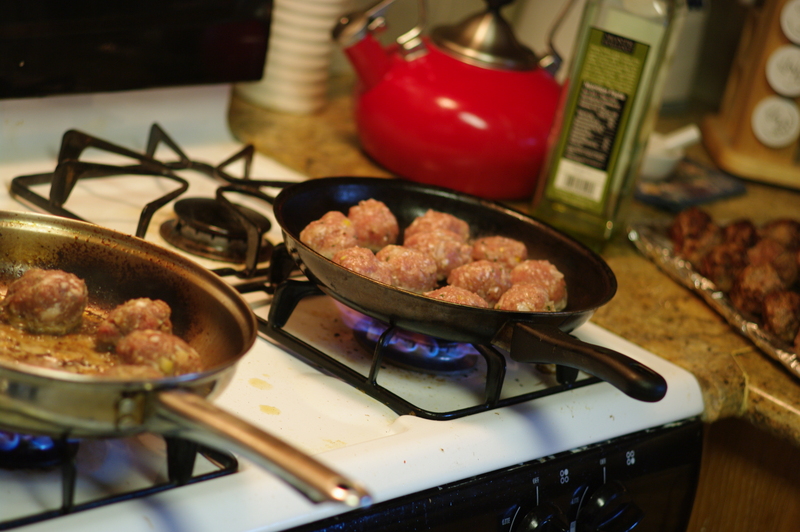 Place the meatballs in the pan, and brown at least two if not all sides of each meatball. 3-5 minutes a side. 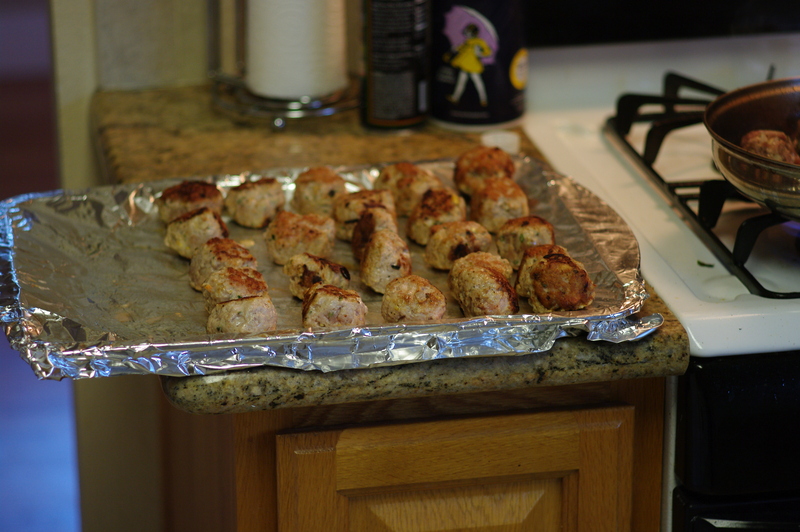 Then lightly oil a baking tray and line the meatballs up on it. Place in the oven and cook for about 15 minutes. This recipe is similar to the last one in that is eschews the bread as binding, and opts for a second egg. Who needs those extra carbohydrates anyone, and why would we distract from these exciting flavors with fuddy duddy old bread? Aji peppers are a strain indigenous to Peru, which may be home to world’s most exciting cuisine. It involves a fusion of elements from the whole world over, and the result is spectacular. If you have never had the pleasure of trying it, get moving, because it is great. Make sure to order a Pisco Sour to wash it down with too. You won’t be disappointed. Maybe one day my friend Monica will fork over some of her mama-sita’s recipes so I can get to fixing my own Peruvian delights. Until then, I’m left like a little chancho just hoping for an invitation. One of the characteristics of a lot of Peruvian cooking is how spicy some of it’s dishes can be. The most famous pepper, at least in my mind , but I’m no expert, is the rocoto, which is a gem in it’s own right. However, of the 12 or so varieties of hot peppers I have growing in my garden, I have no rocoto. I did however, have lemon-thyme, and the aji-limon peppers I had planted had finally ripened, and I was amazed at how incredibly hot, yet incredibly citrus their flavor was. I thought playing off of the theme of things that were reminiscent of lemon, but not actually lemon could lead to a very delicious recipe. After all, everyone loves to flirt; and what is coquetry but dancing with every phrase you can around what you really mean, without ever actually saying it? On the other hand, being too direct is just stepping on your partner’s toes. Who wants to dance with that oaf? 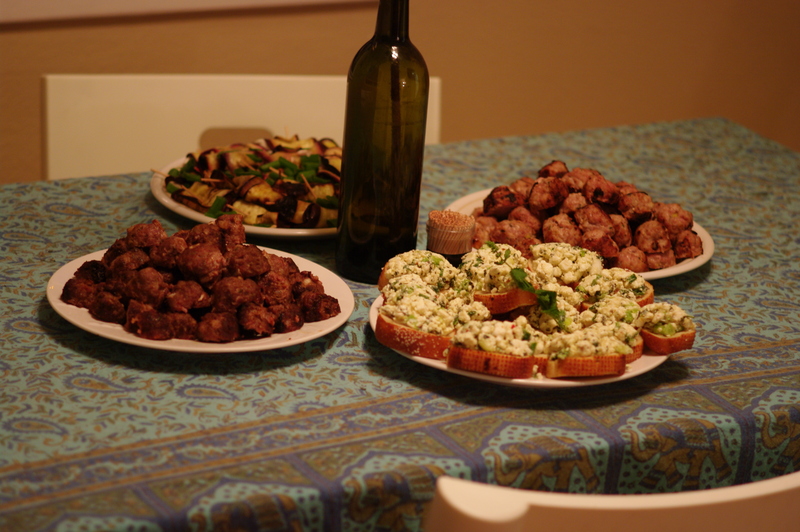 The preparation of these is just the same as the beef meatballs. Mix all the chopped and diced ingredients together so that they are evenly mixed. 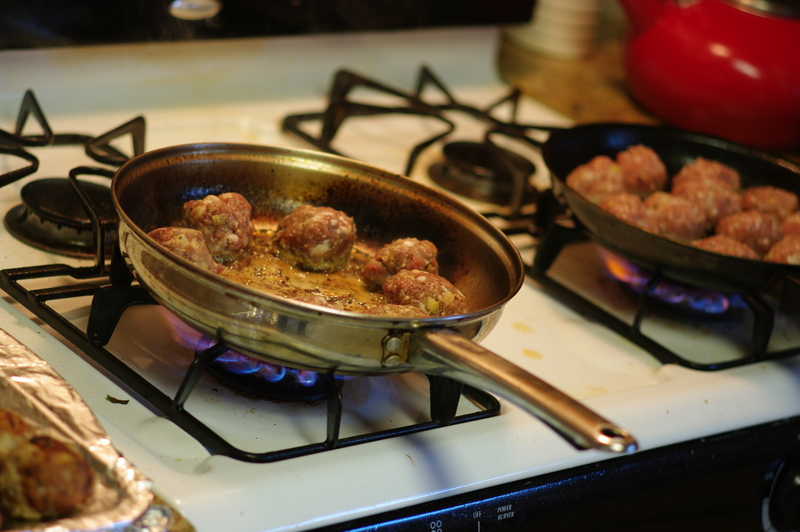 Then, evenly brown the meatballs in a pan over medium heat, finishing the cooking in a 400 degree oven for about 15 minutes. I grew up beekeeping. My earliest memories are of my dad smoking the bees out of their hives so we could gather the combs and extract honey for ourselves. We still have some of the old jars of that precious stuff. Consequently, like a good Latvian, I love honey in and on everything. Though I must say I’ve never had honey like the kind our bees used to make. My childhood home is in a dense holly and juniper thicket, so our bees had a healthy evergreen pollen diet. I’ve never seen holly honey for sale before, but it is thick and dark, and one of a kind. If you ever have a chance, please, do try it. In this recipe, I used orange blossom honey my dear sister sent me from Florida. Though, if I ever came across it at a price I could afford, I wouldn’t hesitate to use lavender honey. Really, any light honey will do. The sweetness of the honey really contrasts brilliantly with the sharp herbal flavors, and the hint of spice from the fresno in the cheese mix. I especially think the lavender plays brilliantly into the recipe, as it is delicate, but very distinct – the kind of ingredient that will catch your audiences palate of guard in the way that will always bring them back for seconds. To be honest, I came up with this recipe while making what I call a cheese salad. In other words, I would just eat the topping for these toasts by itself with a spoon. Saves me from the grains again! 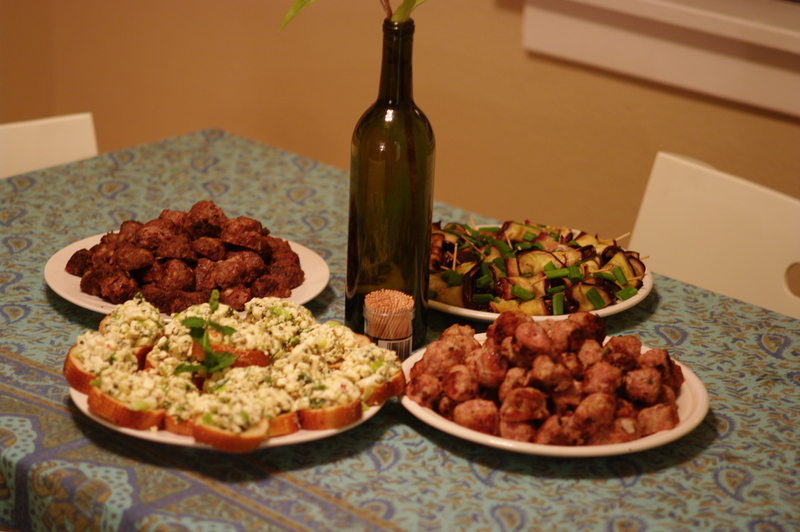 But not everyone thinks that is normal, and finger food works better for parties too. My roommates liked the stuff as a topping for fish and pollo asada tacos too, so I figured little crostinis would make a fine base too. Begin by cubing the queso fresco into very small pieces and place in a bowl. Then slice the green onions as thinly as you can. Chop the mint. Remove the lavender buds from the stems, and chop as finely as you can. Dice the fresno finely. Add all of the ingredients to the bowl, and toss together. Taste for salt and pepper and other flavors, adjust any of the elements as necessary. None of the flavors should jump out more than any of the others, but they should all be noticeable. Let the cheese salad sit covered in the fridge for about an hour for the flavors to meld. This entry was posted on September 1, 2010 at 12:11 am and is filed under Uncategorized. You can follow any responses to this entry through the RSS 2.0 feed. You can leave a response, or trackback from your own site. Your food blog is beautiful. I am so impressed. The pitture Are great. I remember you Dr. Landsman. Are you still in Florida?